White Pothos is a wonderful plant, which grows long leafy vine that trails freely. It is an indoor plant also known as Devils Ivy. They grow perfectly in low light conditions and erratic watering, which makes them a must have in every space and an easy-to-care plant. 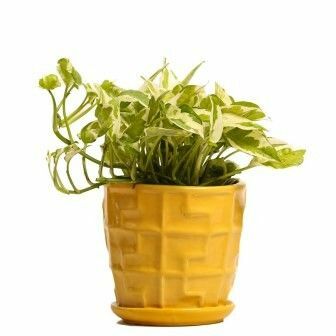 The tissue cultured plant is placed in a finely crafted yellow colored pot. If you have a plant lover around, then it will be an amazing surprise for them on any special occasion.